Hurry—the first program is set for 6 p.m. Monday, Nov. 6! 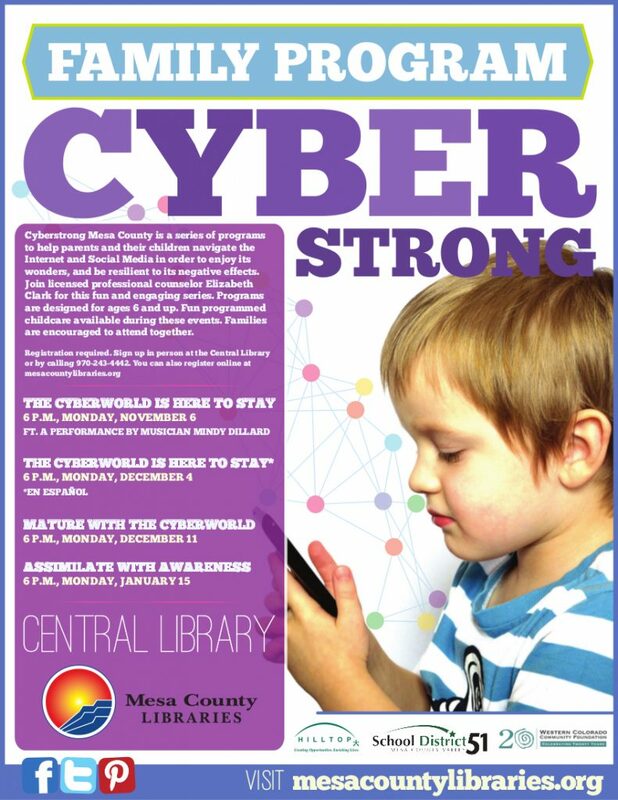 Please register at mesacountylibraries.org or by calling 970-243-4442. Studies and articles have been popping up about the impact of various online activities particularly aimed at children. We continue to chart the territory as digital dependencies develop and permeate our lives. The cyber world is a glorious place, but it can be tough on the brain. CyberStrong is a series of three successive talks developed by Elizabeth Clark who has been a therapist for children, teens, and families for the past 30 years. Clark is passionate to understand how to keep strong emotionally, sexually, and socially in this cyber­-influenced world. Why take time to attend? It is a fun family night out with food and childcare, all at no charge! While Clark leads sessions for adults, children 6 years of age and older will attend a separate program hosted by Mesa County Libraries Youth Services, with assistance from licensed child care providers. The first program (Monday, Nov. 6) hosts musician Mindy Dillard, who will make music with the kids with gentle messages about being happy and healthy. Adults will hear simple solutions for children who are becoming consumers of the cyber world to more truly enjoy the Internet and social media. We will start a conversation on exploring good practices to make sure it’s working for us, and not the other way around. To wrap it up, children will reconnect with their grown-ups, bridging their experiences with laughs and refreshments. What do we hope you will gain? Mesa County Libraries saw a good opportunity to be involved with other organizations—Mesa County Valley School District 51 and Hilltop Community Resources—to address what is on many people’s minds: the hope that anyone who is struggling gets the help they need. Community, relationships, and empowerment are values we have in common. By collaborating, we offer greater opportunities to our community. This effort is supported by the Western Colorado Community Foundation, which is supported by local donors and provides leadership in addressing community needs. They fund community-wide solutions to improve quality of life. Over the next several months, Clark will also present concurrent CyberStrong talks directly to teens at a number of D51 Schools. Please register via the online Events Calendar at mesacountylibraries.org or by calling 970-243-4442.